Forrester first mentions the distinction between Above the line (PFM) tooling and Below the line (project support) in its PPM overview in 2012 as well. In this post I give the 5 main reasons why different tools have emerged that excel in their process support of PFM versus PM. Project management is about focus on delivery of project results by all the contributors, so tool support must be focused on status reporting, task workflow, progress, and deliverables. It is action-focused and deals with exact (status) information, and should be focused on quickly sharing within the project team. Portfolio management is essentially a decision process, so the tooling should be decision-flow oriented, and the decisions are complex, multidimensional, embedded with conflicting requirements and uncertainties.. This requires decision support tooling, allowing scenario analysis, supporting incomplete and uncertain data and changing assumptions. Whereas it is essential for portfolio management to have comparable information on all projects (how else can we build the best portfolio), it is equally essential that project support tools offer the best support for the teams. This drives the need for integration with the work processes and tools of the team. These are very different for an agile software development than for a CapEx-heavy construction project or for a new business alliance, to name just a few project types. The biggest impact portfolio decisions are taken very early on in the life-cycle of candidate projects, usually well before full-blown project plans and business cases are developed. In this stage, different people are involved, different roles contribute to the decisions, and the timing may be well ahead of project execution. Since portfolio management is about the alignment of initiatives with strategy, it is also a process where strategy is tested and refined by linking it to execution. In line with the above underlying reasons, the landscape overviews of Forrester and Gartner show no tools that happen to excel both at PM and at PFM. So apparently these differences are not easy to reconcile in a single (PPM) tool implementation. There is also a major disadvantage of implementing a combined PPM tool solution: you cannot do PFM before all projects are entered, and this is usually a long-term deployment trajectory. Forcing all projects in a quick way into one PPM tool will not do justice to the individual team’s needs for getting benefits at PM level, and forcing projects in that should not be running in the first place is a waste of time and effort (more about this in a previous post). Building on the previous point, even if we would have put in all the hard work to bring all projects together in one PPM environment, by the time we are done the business will have changed. New acquisitions, new businesses organically grown, new alliances all bring their own projects, so they keep challenging the one-size-fits-all PPM solution. And then we choose to ignore that innovation portfolio’s will contain more and more open innovation projects, where a standard tool cannot even be reasonably imposed on all participants. So, what does a good portfolio management tool look like? 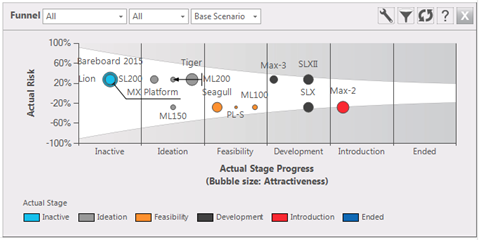 In addition to offering the best possible support for the portfolio management process (decision-support oriented, the right portfolio analytics, and the ease of use to involve all stakeholders), the tool should be embeddable in an IT landscape with different PM tools (ideally where different projects are managed with the best tools for their purpose). The PFM tool can then take the role of the consolidation at the portfolio level, without penalizing the projects. And project candidates that are yet PM ready can still be included in the portfolio management process. Have a look at our FLIGHTMAP portfolio management solution and its FLIGHTHUB integration architecture to see how that can work in practice. Previous Post The end of PPM as we knew it, and what’s next? Next Post No bubbles in the boardroom?